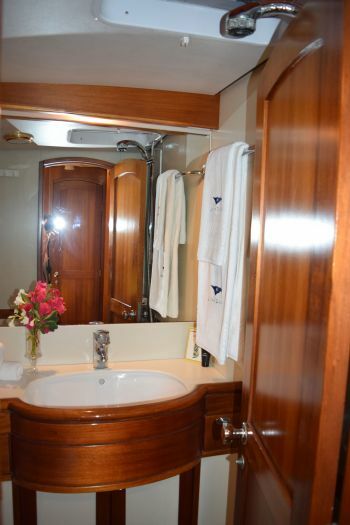 Full Beam Master Queen Cabin + 1 Guest Queen + 1 Upper & Lower Twin Cabin, all with private bathroom but the crew share one. The crew are self-contained forward. 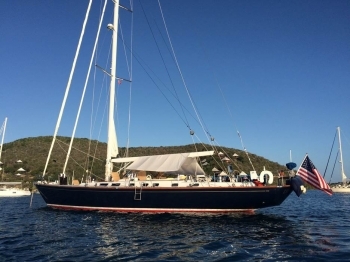 Built by Sweden Yachts in 1994, the 70′ cutter LUNA DANNS, whose captain is Nick Meyer from Cornwall, is Hull # 1 (of three) and what a beautiful vessel she is, and what a nice captain! We inspected LUNA DANNS in Antigua in December, 2016. 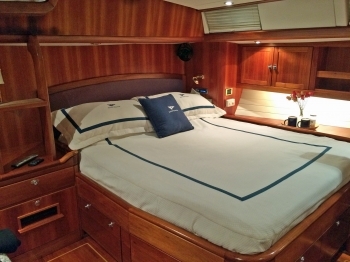 The yacht is beautifully appointed, sparkling clean, sails beautifully, accommodates up to six guests in three staterooms, and the British captain Nick couldn’t be nicer! He is assisted by a young lady, although Nick often shares the cooking duties himself. These two are a good team. 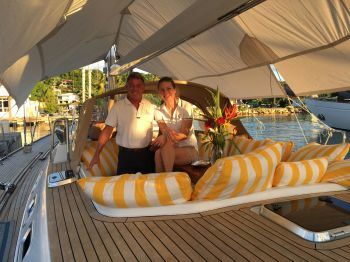 Presently in Antigua, Nick has finally settled on chartering New England this summer, although he is flexible…. He wants to go where the charters take him. This could mean Florida, the Bahamas, the Chesapeake, or Bermuda for the America Cup Races in June, New England – even the Mediterranean! Please don’t hesitate to let us know where you want to go. Nick says LUNA DANNS is a great sailing yacht! 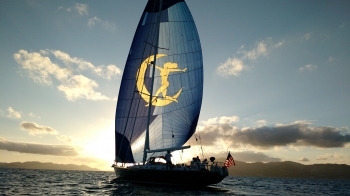 She easily pushes11 knots upwind and has been known to surf 20 knots downwind in a gale. Nick loves sailing! 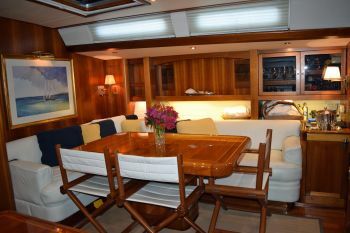 With dark blue hull and yellow and white striped cushions in the cockpit, the yacht has flush teak decks and a second cockpit aft for the crew to handle the lines from. 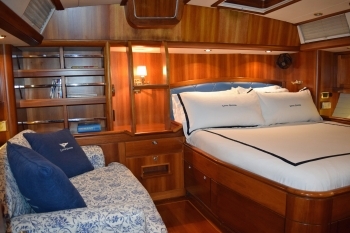 So guests can sit comfortably, undisturbed at sea. While there is a second crew member aboard, Nick does a lot of the cooking. With three fridges aboard, he is a professional chef, as well as a life-long sailor, with knowledge of French and Japanese languages. LUNA DANNS saloon is beautiful! 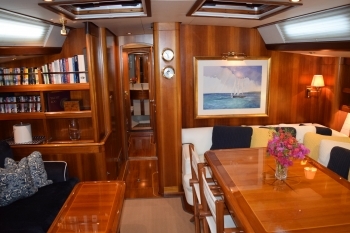 A real classic below with honey-colored teak paneling, glass-fronted cupboards behind lockers of long-stem wine glasses, the spacious saloon has a dining table and lounge on opposite sides of the cabin and galley aft. The framed pictures of water colors add a homey look. The yacht sleeps five adults or four adults and two kids. 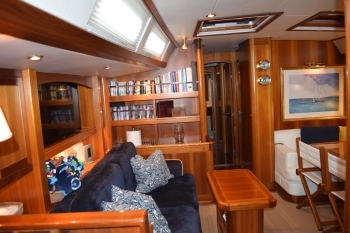 The master aft with custom Queen bunks is the full width of the ship with couch and vanity, and ladder access to the cockpit; there is TV with blue tooth plugs…. 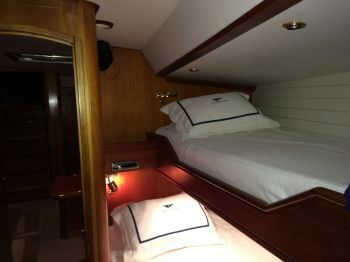 Two additional guest cabins are forward of the saloon, one with double bed, the other with upper and lower single beds. 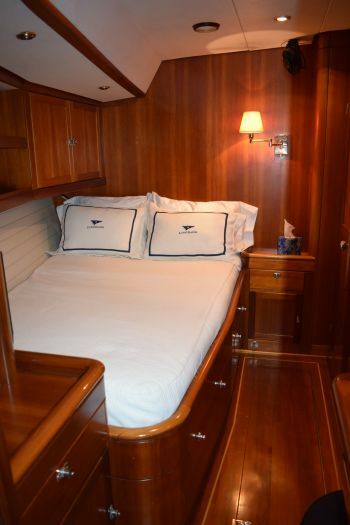 All have access to a bathroom, but the crew share one and sleep in the forepeak with access from on deck only. These two forward cabin have AC, hatches, fans, TV with DVD player (not blue tooth), and all lines lead to the aft cockpit.